Paul Pen, a Spanish author, pens his debut English thriller, The Light of the Fireflies which unfolds the story of a young boy who lives with his close-knit family in a basement, as his family claims that before his birth, a terrible fire had destroyed their home, their skin and everything along with it, except their lives. This is his story of how he becomes successful to escape from his family secrets and from that dark basement. A few days ago, some fireflies arrived in the basement. His grandma said, There’s no creature more amazing than one that can make its own light. That light makes the boy want to escape, to know the outside world. Problem is, all the doors are locked. And he doesn’t know how to get out. The boy, our protagonist, has forever lived in the dark basement illuminated by faint light bulbs, that is located underground. His father shares the story of how they started living underground due to the fire that claimed everything in its wake, without their lives. His elder sister suffered the most as she needs to wear a white mask all the time. The boy has a mother, who teaches him about worldly things, and a grandmother who shares fictional stories and a crazy older brother. The boy is contempt with his dark life and could be often found playing with a thin ray of sunlight that has managed to enter their basement through a tiny crack. But one day he sees the fireflies in the basement, that leaves him with a feeling to escape this sad life and into the world above. The trouble is all the doors are locked and the keys are hanging from his parents neck as a pendant and they would never let him escape into freedom. The author's writing style is extremely eloquent and is lace with thought-provoking feelings. The gripping plot is very layered as the story shifts from the boy's childhood to present to his adult life and in between shifting to the story of his family before his birth. The mystery is dark abd disturbing and becomes scary as the author eventually reveals the secrets behind this family's past and with lots of twists and turns, it will keep the readers anticipating till the very last page. The pacing is really fast as the readers will be left curious with the thought of what is actually the truth behind this family. The characters are extremely well-drawn and are completely inspired from realism. The bond of togetherness in this family is very evident from the very first page and the author centers his whole story around this bond and never lets it break it even for once. The main character and the rest of the supporting characters has no name in this book, and that makes the story even more fascinating to read. The main character, the boy, is an interesting character, as he gets allured and misdirected with the so-called truth shared by his sister and how he tries to protect her and the readers will absolutely root for the boy as he tries to escape from this basement. The boy is an adorable character and an epitome of a responsible son who will take care of his family no matter how bad they are. Overall, the story is enlightening and extremely spine-chilling that leaves with a sense of respect and love for one's own family. The emotions are deep and evocative and has the power to make the readers move even of the terrible things. I believe this is a must-read story for all to understand the choices of a family makes and to value one's own family, no matter how hard it becomes in the end. The book is translated into English by an award winning translator named, Simon Bruni, who did complete justification to the original story of Paul Pen that was first published in Spanish. Verdict: An enthralling family thriller which is part psychological. Courtesy: Thanks to the author, Paul Pen, for giving me an opportunity to read and review this book. Paul Pen is an author, journalist and scriptwriter. He won Spanish newspaper 20minutos' Gonzoo Prize for author of the year, awarded by popular vote. His first novel, The Warning, earned him the title of Fnac New Talent in 2011 and has been translated into German and Italian. An American film adaptation of the novel is currently in process. He has recently published Thirteen Stories, a weekly collection of supenseful tales in digital format. 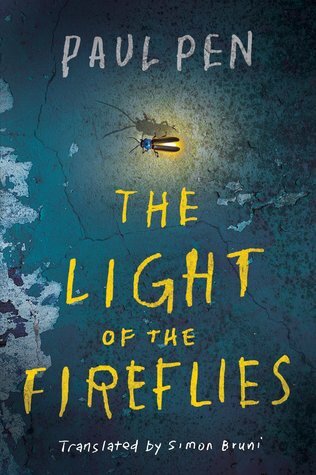 The Light of the Fireflies is his chilling second novel, also being adapted for the big screen, and available in English for the first time. Paul Pen's writing is a potent, deeply immersive experience for mind, heart and nerves. Prepare to be shocked, charmed; touched, horrified. Prepare for darkness and light. Love and terror. This is Pen's unique brand of suspense fiction, with echoes of Dahl, King and Hitchcock. His razor-sharp, irresistible storytelling is carefully and generously concocted to be enjoyed both by the masses and the more bookishly sophisticated.